So the cool thing is that now that I have a year of blogging behind me, I can look back at all the fun times I had last year. What delicious times they were. The bad part is that I have to share the ginormous family computer right now since my laptop just crashed. Argbargdarghumbadeedumbadeegrrrr. That was me grumbling. Get used to it. You'll be hearing a lot of that till my new hard drive gets here. In the meantime, enjoy a few of these moldy oldies. They aren't really moldy. I promise. I jut like saying that. If all went well, you should be able to open up the recipe in another tab by clicking on the photos. These sweet potato cupcakes with browned butter cream cheese frosting and candied pecans were easily the most delicious thing I ever made. It was the most memorable flavor and texture explosion of our lives. I'm a sweet potato freak though, obviously. 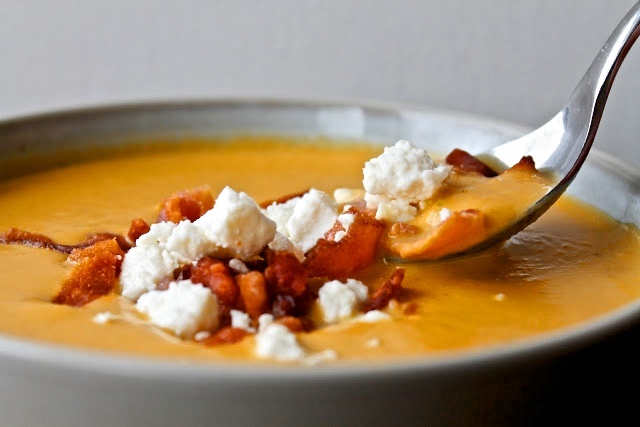 Pumpkin soup with bacon and feta. Another flavor and texture explosion. Creamy soup, salty feta, crispy bacon. It's a dream come true. Pumpkin whoopie pies with chai spiced buttercream. The best part of these, other than the obvious (you know, the flavor-texture explosion thing), is the decorating. I mean, dusting powdered sugar over little maple leaves? Sometimes I amaze myself. And real cinnamon sticks? When did I have real cinnamon sticks? They're so cute. More pumpkin! These waffles were probably my all-time favorite waffles I ever made. I was really pumped that they were orange since the Detroit Tigers were playing in the American League Championship Series at the time. And guess what, THEY'RE IN IT AGAIN. WOOOO. 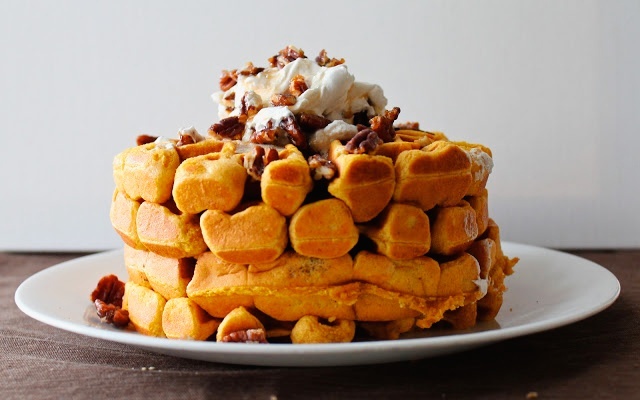 I shall make these waffles again in your honor, Justin Verlander my sweet. 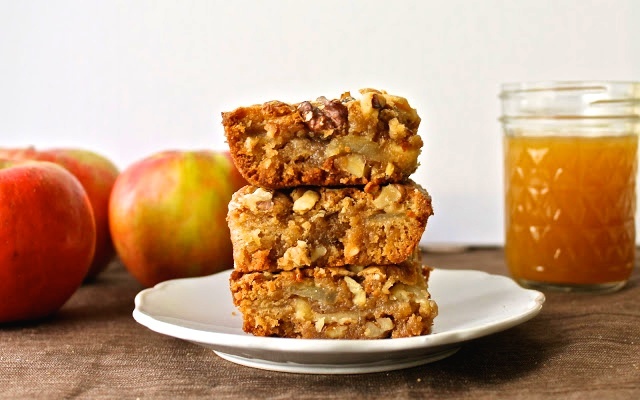 Apple walnut browned butter blondies. I could just chomp down that whole chewy stack right now. 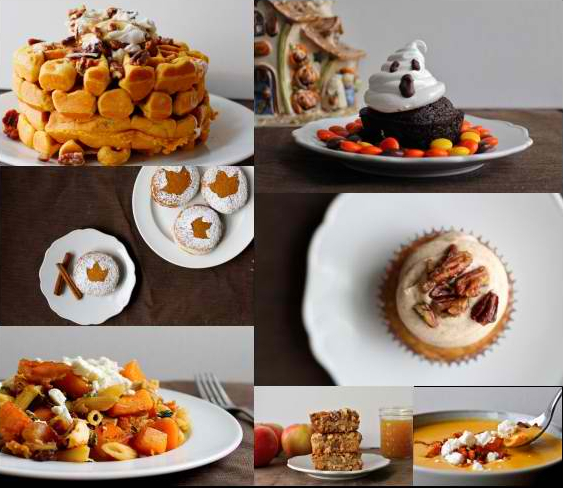 And those honeycrisps in the background.... can I just say I LOVE YOU MICHIGAN. Thank you for allowing me to abide in your beautiful apple laden lands of joy. Oh look! Finally something healthy. KIDDING. Browned butter and bacon are the stars of this show. And the feta again... I guess I was having an obsession. Not that I can blame myself. Find the Browned Butter Penne with Bacon, Chicken, and Squash recipe here. Here's something adorable for Halloween. Ghost cupcakes. Don't be afraid, it's only 7-minute frosting. 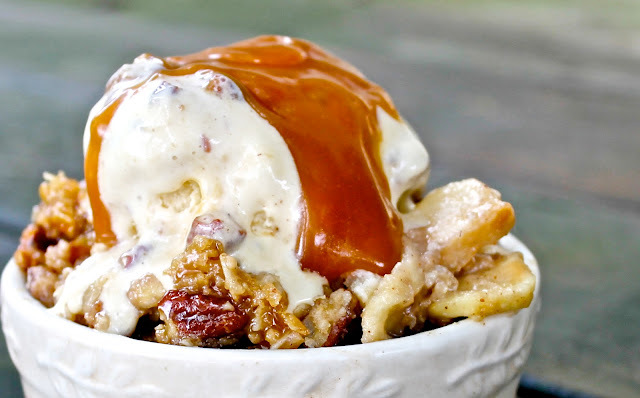 And I almost forgot, this wonderful caramel apple crisp. HELLO. And that concludes today's little collection. Follow on Facebook and Twitter if you wish. Adios.